The Book on Religions and Sects by a Muslim theologian al-Shahrastani (died in 548 A. H./1153) is a short encyclopaedia of religions and religious-philosophical doctrines current among the peoples of the Middle East and Mediterranian in the early Middle Ages. 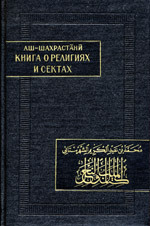 The first part of this treatise, which for the first time appears in the Russian translation and is commented upon, provides the most exhaustive out of the known description of the inner history of Islam and an account of religious doctrines of Muslim sects. The present treatise by al-Shahrastani contains an extensive factual material and is marked by the author's differential approach in description of various religious doctrines thus advantageously differing from earlier works by Islamic heresiographers. The present translation is based on the Arabic text published by M. S. Kilani (Cairo, 1381 A. H./1961) and collated with W. Cu-reton's edition (London, 1846; reprinted—Leipzig, 1923). The discrepancies in texts of the two editions are collated with the corresponding parts of one of the earliest manuscripts of this treatise (copied in 631 A. H./1233) now in the manuscript fund of the Leningrad branch of the Institute of Oriental Studies, USSR Academy of Sciences. The translation is of interest for scholars of Islam, Orientalists specializing on Islamic world, and those concerned with the studies of religion and philosophy. Taking account of the specific character of the text and in order of helping the reader to better understand it aud its significance the publication is supplied with footnotes and commentaries interpreting the dogmatic terminology and data on sects and religious and political figures. The translation opens with an introduction which is devided into three parts. Part one deals with a key problem of Islamic ideology i. e. the problem of the relationship between the “orthodox” and the “heretical” trends in the early Islam. The vagueness and controvercy of Islamic religious documents as well as the absence of a specialized institution whose enactments ceuld bear the force of religious prescriptions made ground for the appearance of a variety of schools of thought and conceptions. In the initial three centuries Islam was represented by a variety of sects and religious trends. The Islamic ideology moulded in the battle of different schools and trends. The two concepts—the so-called “heretical” and its antipode “orthodox” ideology—are very relative and slipulated by the specific nature of Islam. In a nutshell, they are two sides of a uniform ideological process and, in addition, they never existed separately but in opposition and reciprocal influence on each other. The second part of the introduction briefly reviews Islamic heresiographic literature and outlines the main stages of its development. The review mentions only those authors whose works in our view made an essential impact on the formation of Islamic heresiographic tradition. The third part analyses the creative work of al-Shahrastani and also his treatise being a remarkable literary piece of Medieval Islamic science and heresiography. The merit of al-Shahrastani's work lies in the fact that it objectively characterises one of the most important sides of Islamic society's spiritual life in the early Medieval period. It is necessary to pay tribute to al-Shahrastani who managed to overcome the confessional narrow-mindedness and bias typical of Islamic apologists.